The participation fee covers local housing during the project, three vegetarian meals a day, ground transportation to and from the airport and project site, local excursions, short-term travel insurance, a Maranatha t-shirt, and luggage tags. Children 12 and under have a discount of $150. Flights, passports, entrance visas, and vaccinations are not included in the participation fee. All prices are listed in US dollars. In order to confirm a group, small group leaders are required to put down a $500 non-refundable deposit to secure their spots. This deposit then goes towards their individual participation fee. The Multiple Group Project is an opportunity for small teams of 15 or less to experience a Maranatha mission project and train leaders to coordinate a project in the future. Volunteers experienced in construction, the medical field, cooking, children’s ministry and outreach are needed on this trip, and unexperienced volunteers are also welcome to learn new skills! All teams will join together for a large group experience while maintaining the intimacy of their own small group. Small groups may come from schools, churches, families, work groups, or other entities. Small groups on this project will join together to help build two new classrooms for the Guayabo Primary School in Guayabo, Costa Rica. This large Education and Evangelism Center was constructed by Maranatha in 2001. However they are needing additional classrooms to accommodate pre-school classes. Volunteers will help respond to their need by completing two new block buildings on campus. In addition, volunteers will paint two nearby churches. In addition to construction and painting work, volunteers will also conduct local community outreach such as children’s ministry programs and health education. Small Group leaders can register on this page. If you are an individual who is joining a small group or would like to join this trip without a group, please review the information packet and contact your group leader or Maranatha for a different registration link. ARRIVALVolunteers will arrive in Liberia, Costa Rica (airport code LIR) in the afternoon or evening (between 12 noon and 9pm) on Thursday, March 21, 2019.Please wait for confirmation from Maranatha before purchasing your airfare to ensure there is still space on the project. DEPARTUREVolunteers will depart from Liberia, Costa Rica (airport code LIR) in the morning or early afternoon of Sunday, March 31.
springs during the day, but they have some rooms for those wishing to spend the night. We chose this level of accommodations because it’s adequate, safe, and clean, and it keeps the participation fee manageable for school groups and families. We mention this in advance so you can adjust your expectations for the mission trip. The rooms are clean and nicely furnished with private bathroom, AC, bed linens, and towels. No washcloths are provided, so you may want to bring your own. There is no hot water in the bathrooms. WiFi is available, but it isnot as fast as you may be used to at home. Don’t plan on any audio or video conferences, but it should suffice forsending an email home. Laundry services are available at an additional cost. There is no regular pool, but there are pools that are filled with water heated from the volcanoes. The water is notas hot as a hot tub, but it is warm. The group will have time between dinner and worship to enjoy the hot tubs at the hotel each evening. Small groups will be divided into rooms but kept together as much as possible. Volunteers should plan on staying in double or triple occupancy rooms with a roommate. If you would like to room with someone in particular, please let us know prior to the final deadline of the project. Volunteers will purchase their plane tickets for the project. The dates posted are the arrival and departure dates from the project, but due to travel time, you may need to leave a day before the arrival date. Maranatha representatives will meet volunteers upon arrival at the final destination. More information about the flight is available in an information packet available for download above. Booking outside these windows could result in additional fees and missed portions of the project. On Tuesday, volunteers will take a break from work and enjoy the beauty of Costa Rica. The group will travel aboutan hour and thirty minutes to the Pacific coast of Costa Rica to a beach called Playa Hermosa. Here the group willhave the afternoon to enjoy the beach. The beach is safe and clean and has a sandy, gradual slope down to the water. There is a lifeguard on duty, shaded areas, and bathrooms. We have arranged a day use pass at a local hotel that also has a regular pool and additional shaded seating for the group to enjoy. There isn’t much to see under the water, but you can bring snorkeling equipment if you wish to explore. Feel free to bring any additional funbeach items you wish like blow up floaties, beach games, etc. Located near the hotel are a few unique opportunities for activities that can be planned as a short trip during the work days. Each group leader will work with the project coordinator to determine if they’ll take part in an activityand what day they will do them. There is a zipline in the mountains that takes people flying through the treecanopy. There is also a thermal energy plant—something few places in the world have as a source of energy. 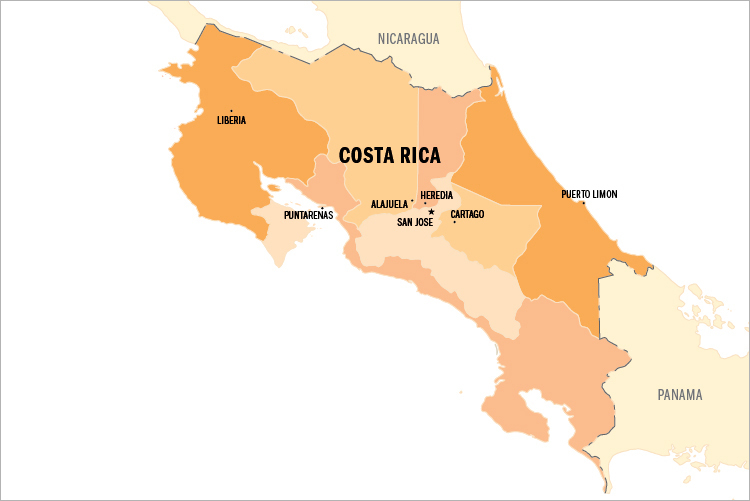 This area of Costa Rica boasts of being the only place in the world that has four sources of energy: solar, wind, hydro, and thermal. The plant we can arrange to visit gets its energy from the thermal energy of the volcano underground. This would be a great educational experience for those who would like to avail themselves of this opportunity. Each of these activities is an additional $5 per person. If you decide to do these activities, you’ll need to bring the cash with you on the project and pay the project coordinator in person. Tropical, hot and humid. Rainy season from May to November. Visit the Center of Disease Control and Prevention website for more details. The Multiple Group Project 2019 has ended, please view our Volunteer Opportunities page for upcoming projects.